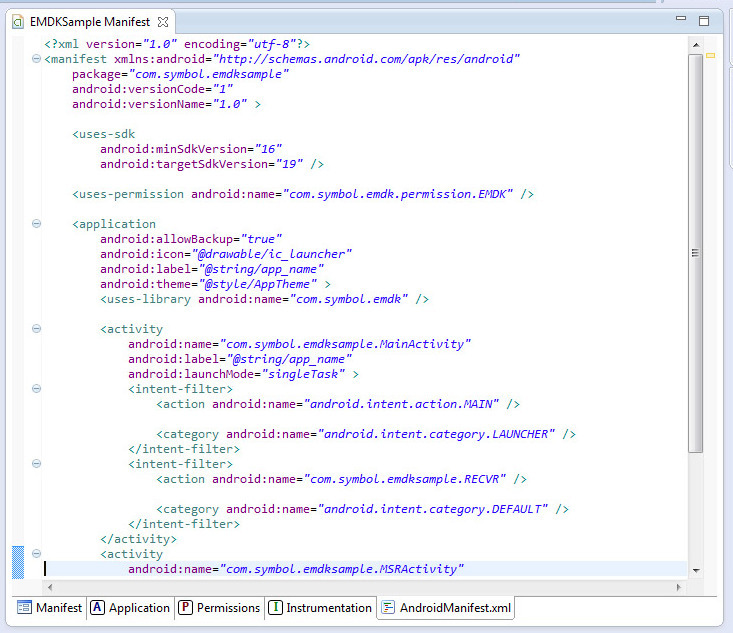 This guide will walk you through adding MSR support and multiple profiles to the Android application you made using Developing an EMDK for Android Application Part 2. 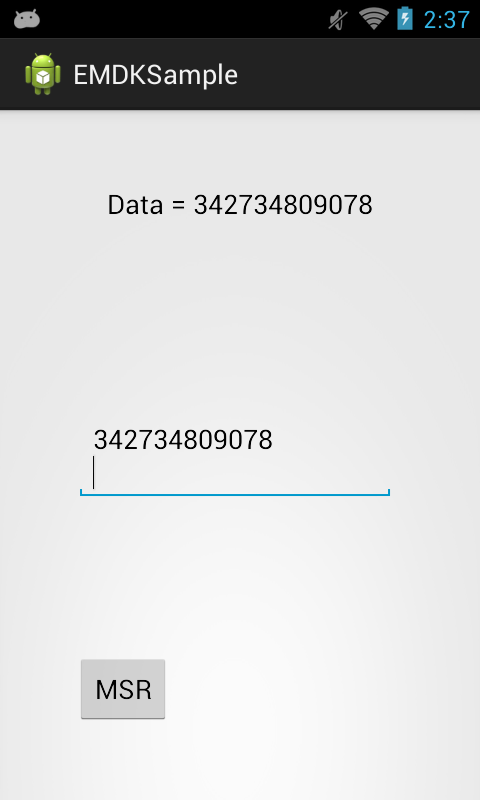 This tutorial will add some more complexity by adding a second screen as well as adding a second Data Capture Profile. For more information about setting up the EMDK please see the EMDK Setup. Let's start by defining a second activity for the application. This activity will be used to to activate a Data Capture profile that listens for MSR data. 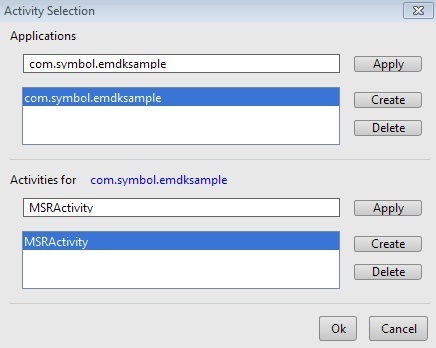 Select "EMDKSample" project, right click on it and create a new Activity with the name "MSRActivity". 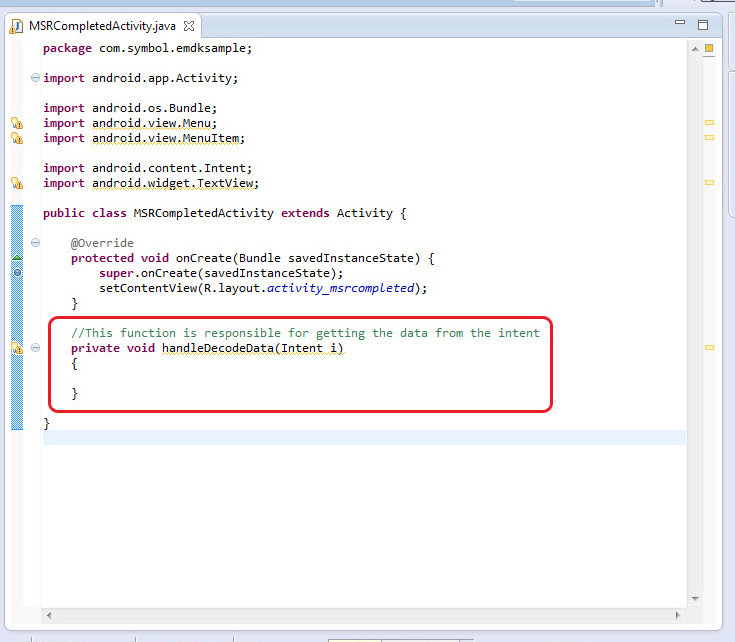 Next let's create a third activity that will listen for the MSR data and display the data to the user. 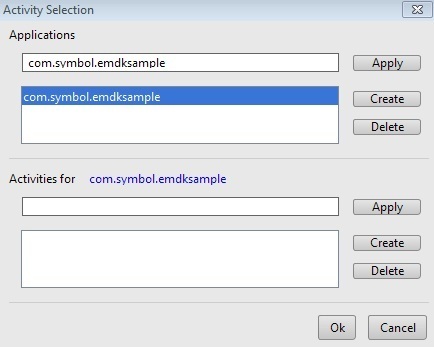 Select "EMDKSample" project, right click on it and create a new Activity with the name "MSRCompletedActivity". Now we will update "MainActivity", adding a button to launch our "MSRActivity". 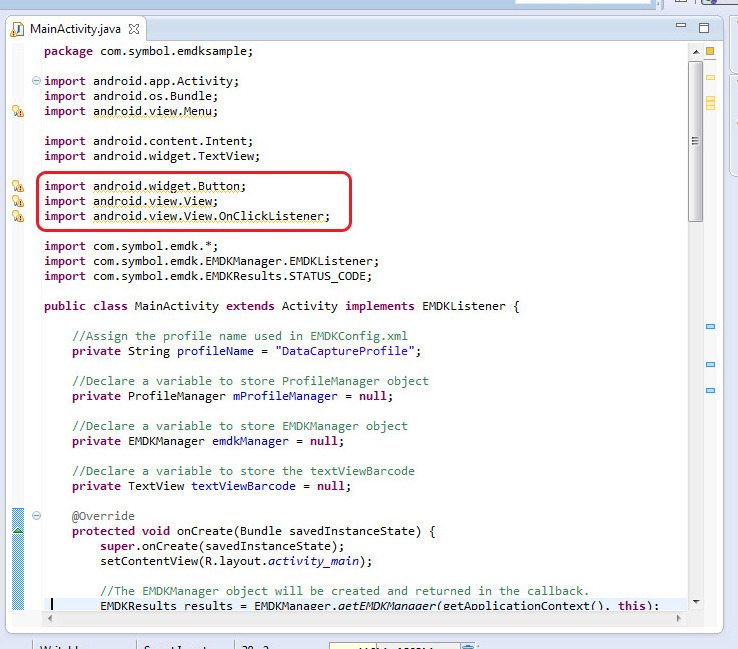 Select "activity_main.xml" from "Package Explorer" in Android Studio. Add the following Button to "activity_main.xml". This Button will be used for opening "MSRActivity". 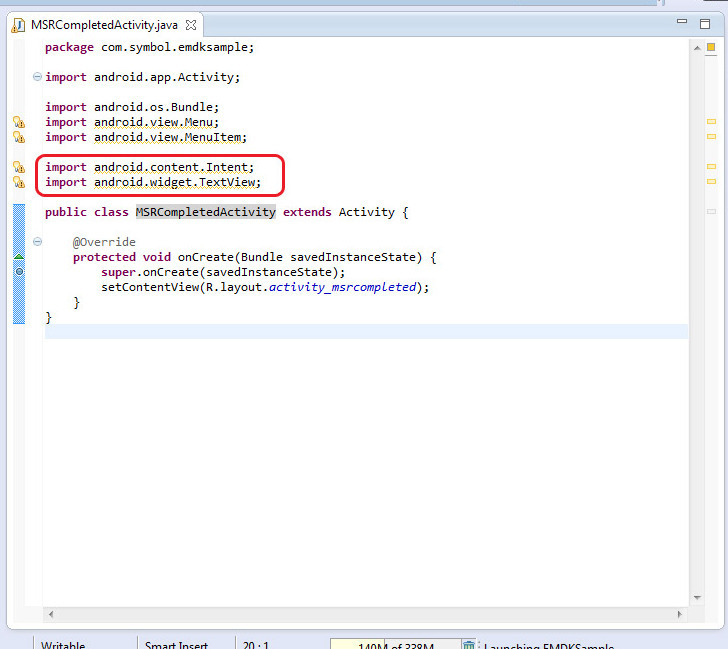 Select "MainActivity.java" from "Package Explorer" in Android Studio. Add the following Imports to "MainActivity.java". 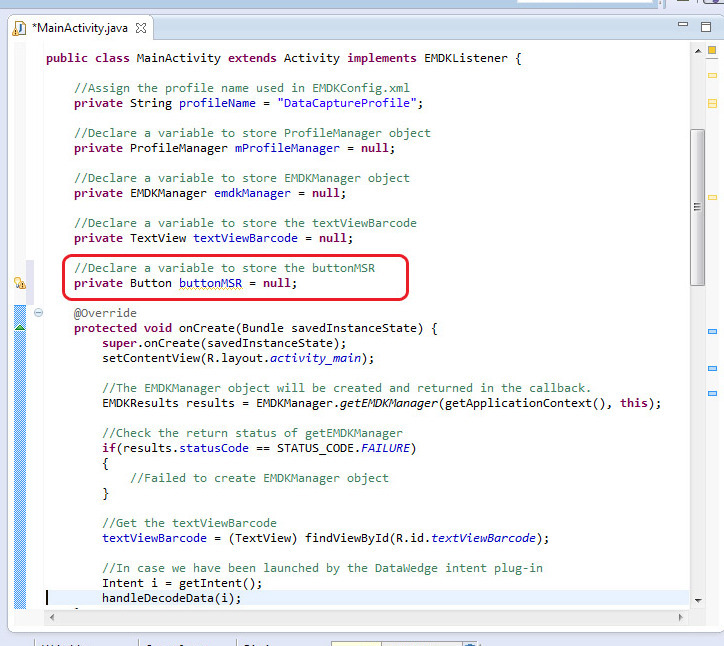 Declare a variable inside "MainActivity" to store "buttonMSR". Inside "onCreate" get a reference to "buttonMSR". Inside "onCreate" add an "OnClickListener" for "buttonMSR". 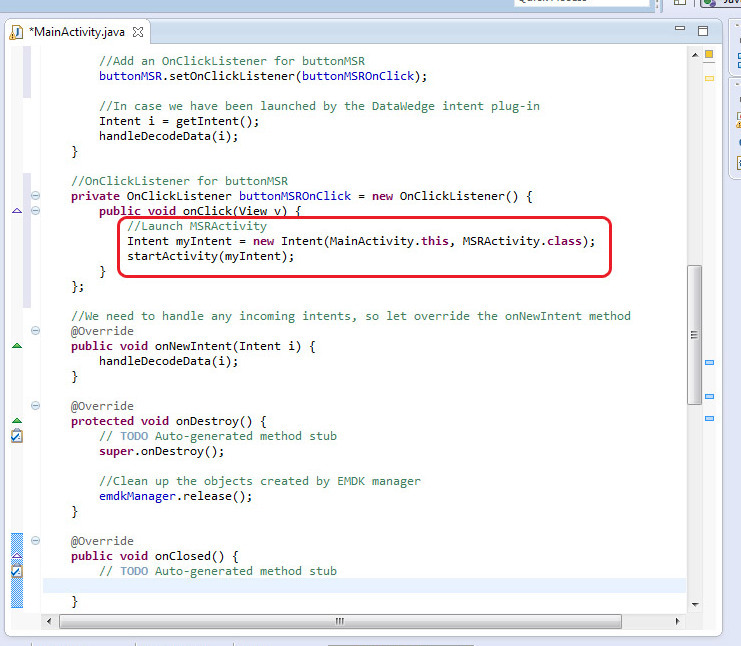 Add a new "OnClickListener" inside "MainActivity". 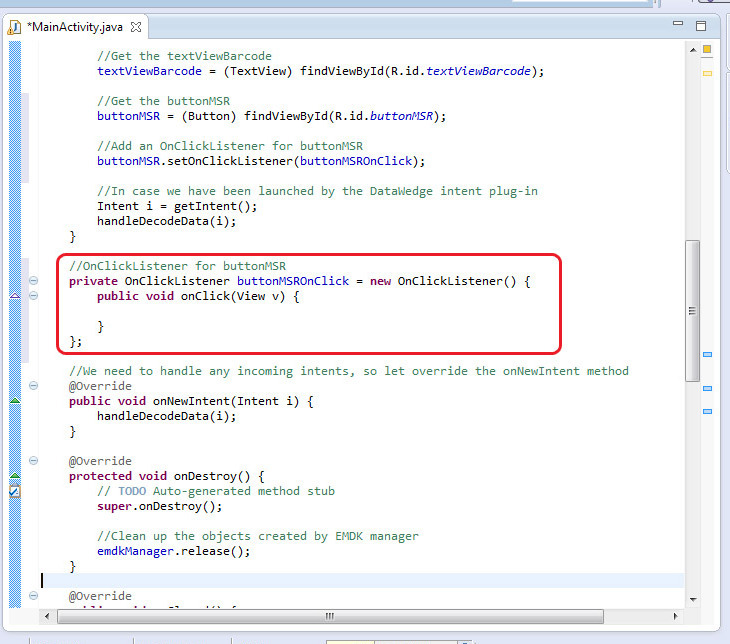 Add the following code to "onClick" to launch "MSRActivity". Next we will create the UI for "MSRActivity". 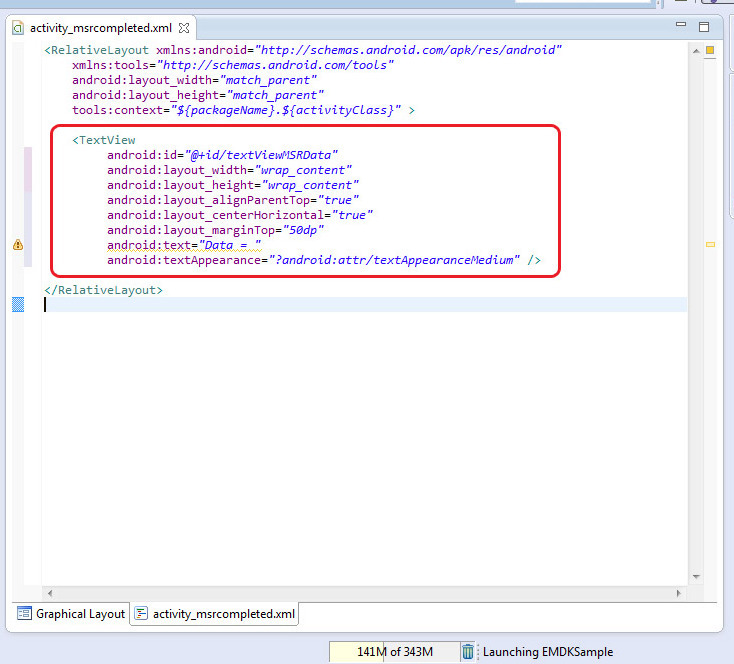 Select "activity_msr.xml" from "Package Explorer" in Android Studio. 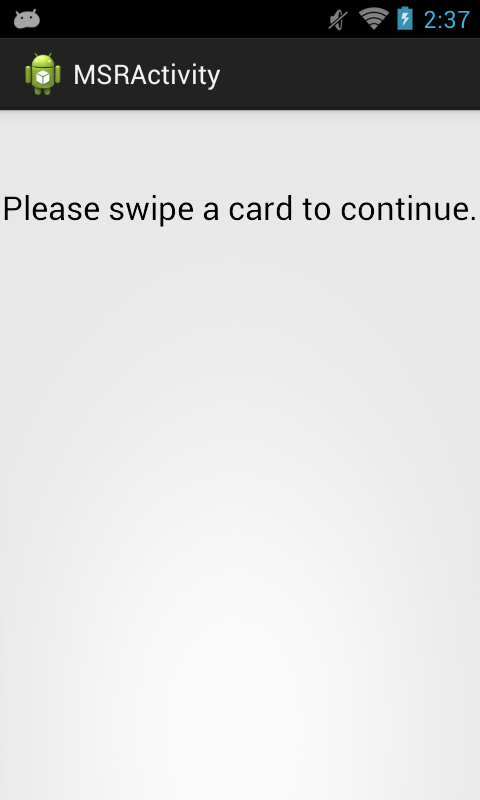 android:text="Please swipe a card to continue." Next we will create a Data Capture profile that will activate the MSR on "MSRActivity" and send the data via a startActivity Intent to "MSRCompletedActivity". 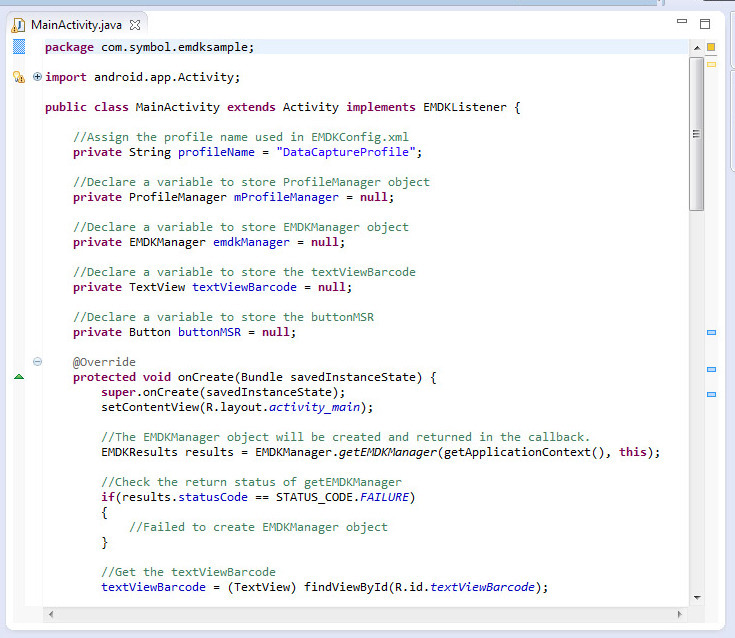 Select "EMDKSample" project from Package Explorer. 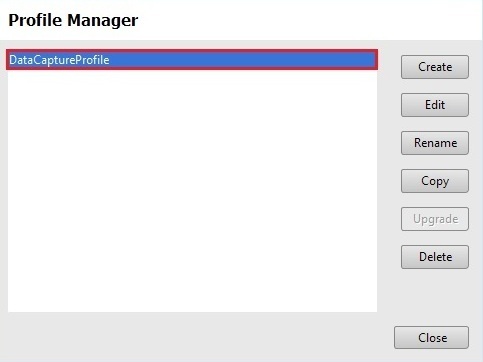 Provide "DataCaptureProfileMSR" as the Profile Name for this tutorial. select "ActivitySelection" from the list of "Available Features" and add it to "Selected Features" using the arrow. 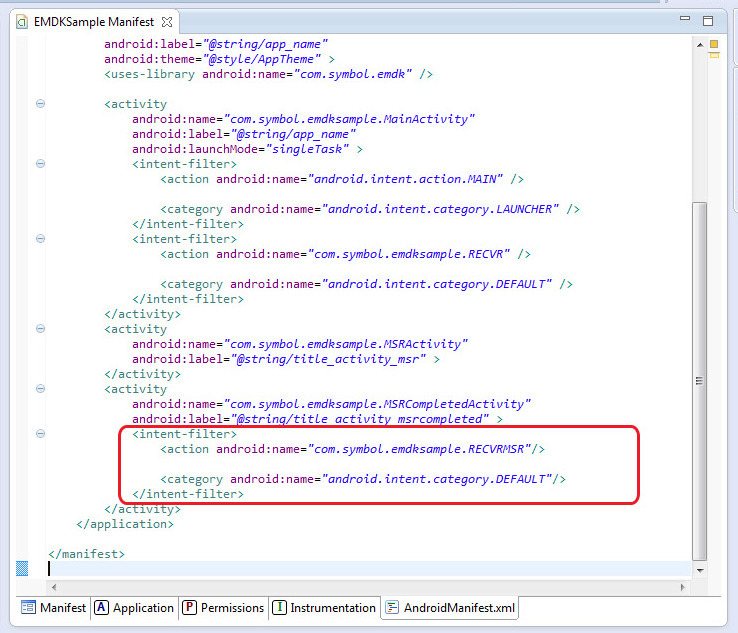 Enter "com.symbol.emdksample" as the application name and click apply. Enter "MSRActivity" as the activity name and click apply. 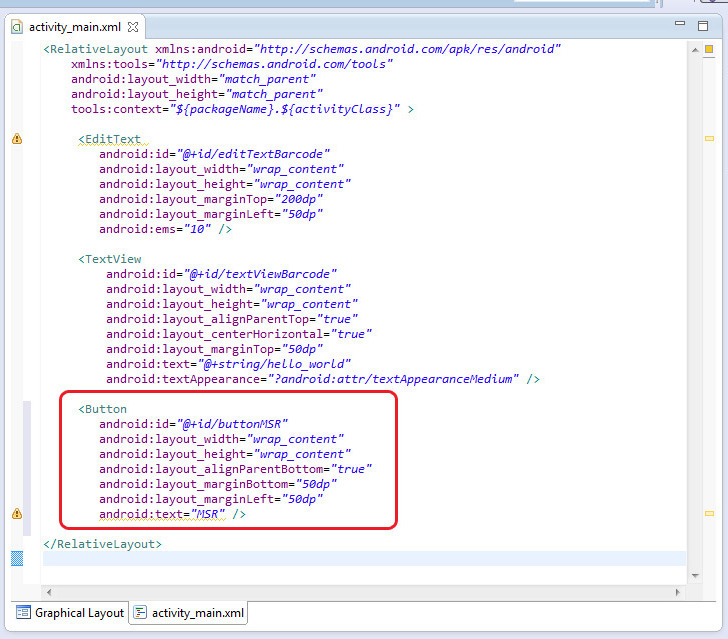 select "MSR" from the list of "Available Features" and add it to "Selected Features" using the arrow. 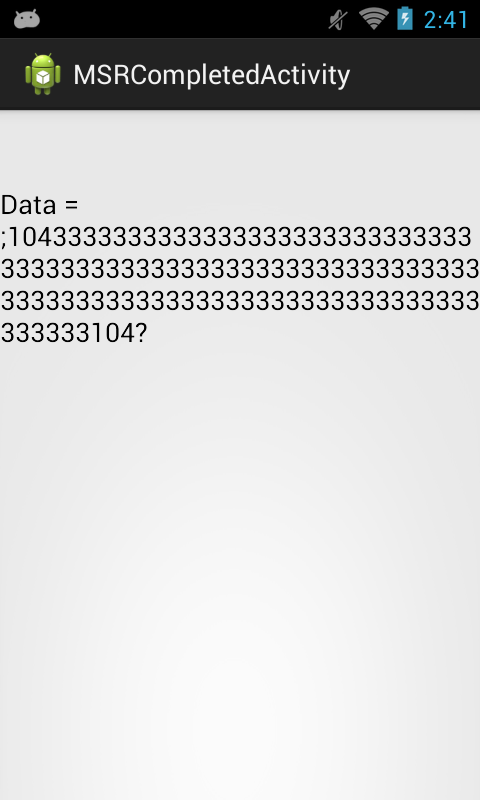 Note: The field "Name" contains user defined name to identify a particular Data Input MSR feature. 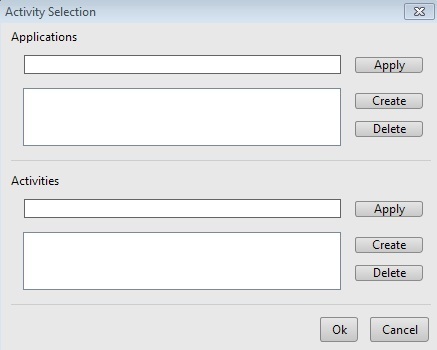 This is required when editing any specific Data Input MSR feature programmatically, which is outside the scope of this tutorial. So we will keep the "Name" field empty. 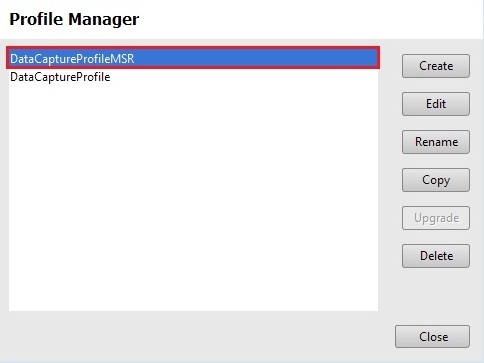 Change "MSR Input Enable" to "Enable". select "Intent" from the list of "Available Features" and add it to "Selected Features" using the arrow. Now we will configure the "Intent" parameters. 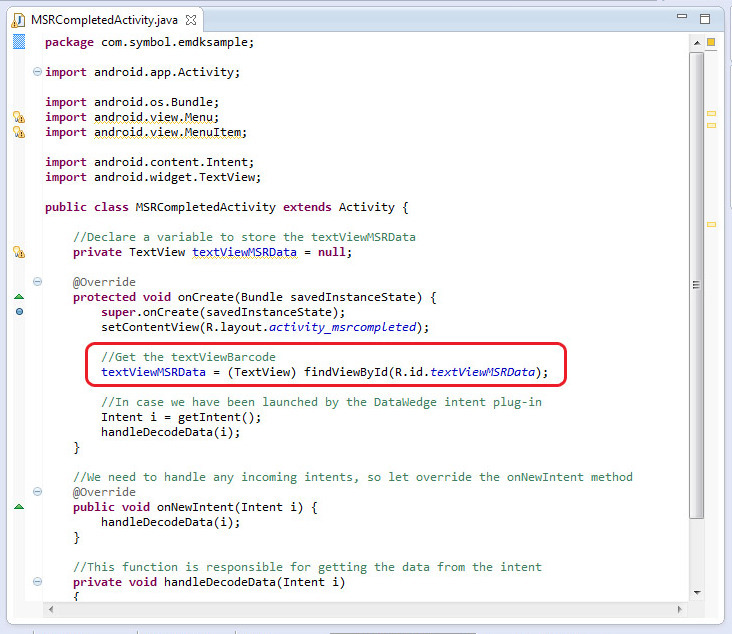 Switch "Intent Output Enable" to Enable". For "Intent Output Action" enter "com.symbol.emdksample.RECVRMSR". 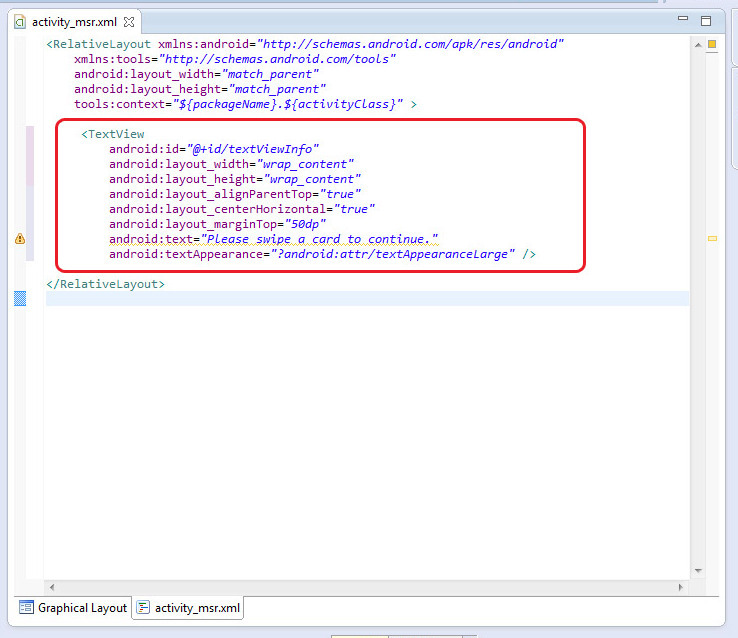 For "Intent Output Category" enter "android.intent.category.DEFAULT". Switch "Intent Output Delivery" to "Send via startActivity". 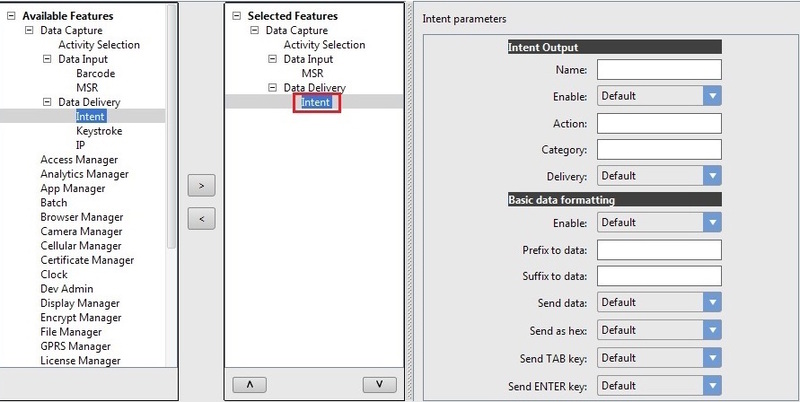 Switch "Basic data formatting Enable" to Enable". 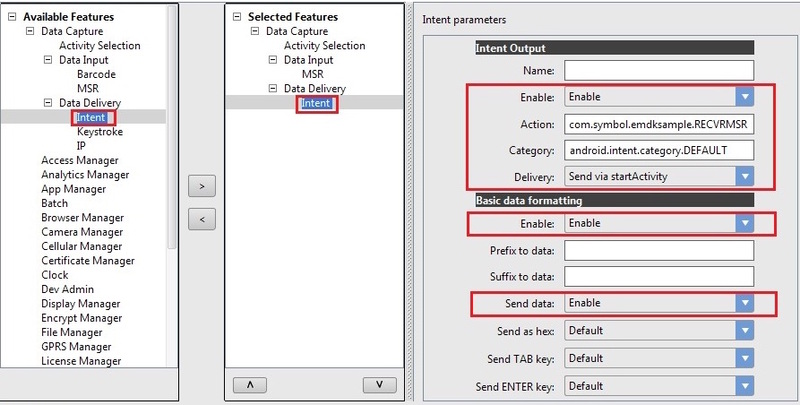 Switch "Basic data formatting Send Data" to Enable". >Now the "EMDKConfig.xml" file under the "\assets" folder will be updated with your changes. Now will add an Intent filter to our Manifest file to allow "MSRCompletedActivity" to listen for our new Data Capture Intent. Open your application's "Manifest.xml" file. 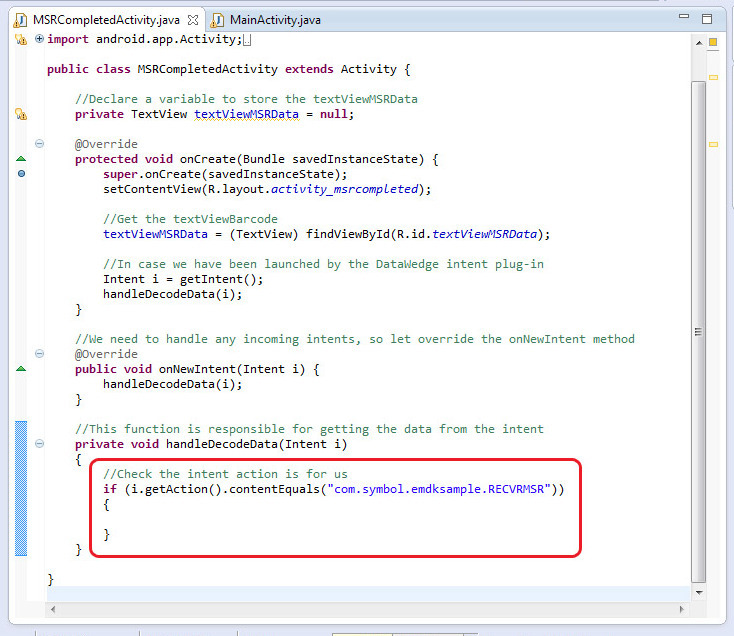 Add the following configuration to the activity "com.symbol.emdksample.MSRCompletedActivity" to revive our MSR intent. 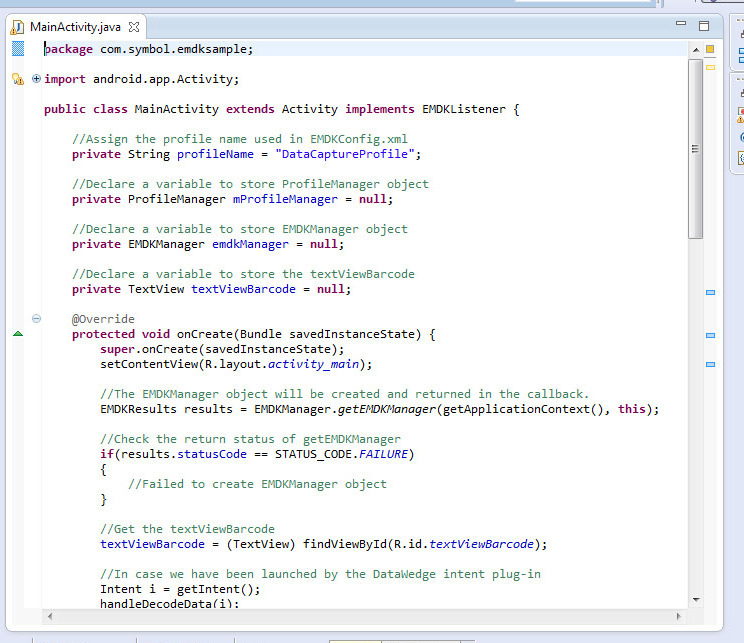 The intent action name should match the value of "Intent Output Action" in the EMDK Profile Manager. The intent category name should match the value of "Intent Output Category" in the EMDK Profile Manager. Next we will register our new Data Capture profile from "MainActivity". Select "MainActivity.java" from "Package Explorer". 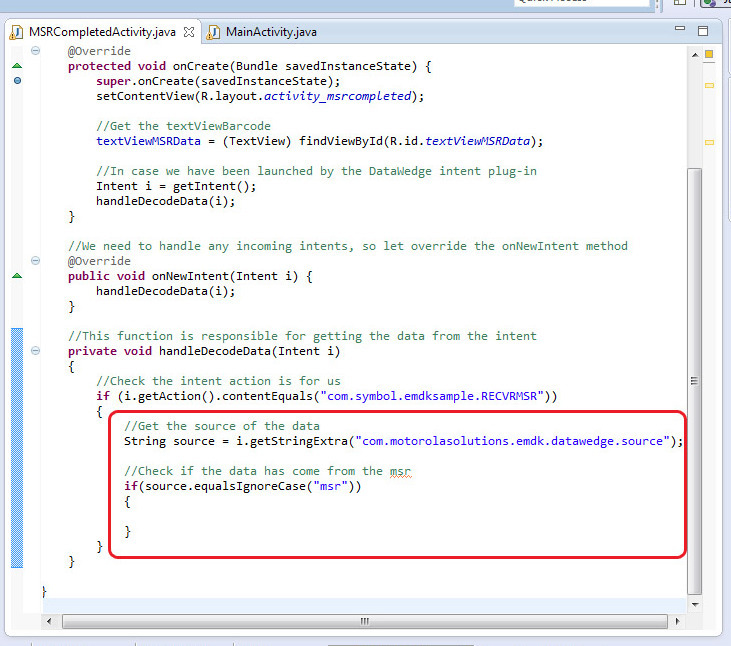 Inside "MainActivity" add the following code to hold the name of our MSR profile. 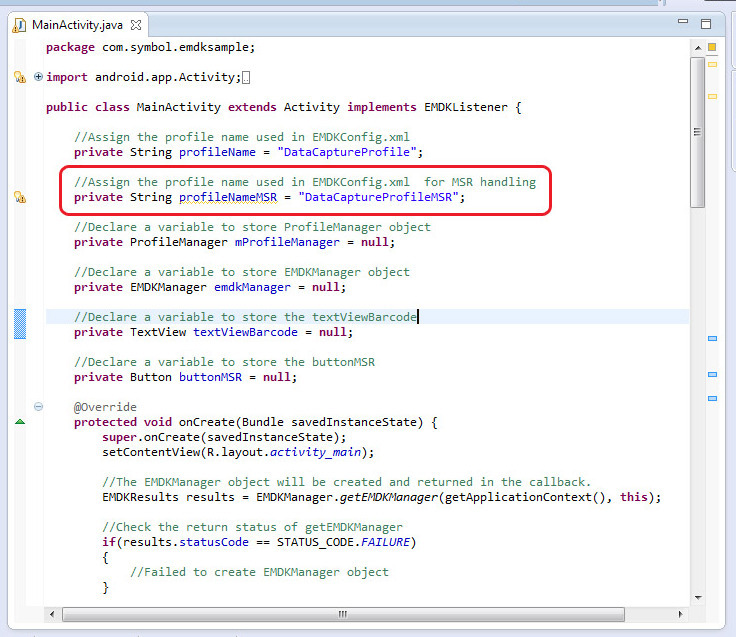 Inside "onOpened" add the following code to register the MSR EMDK profile. 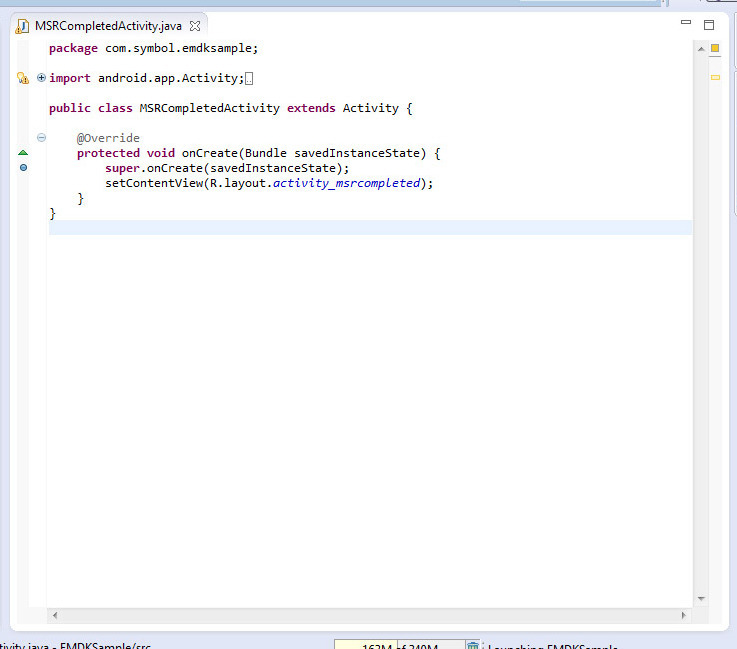 Now we will create the UI for "MSRCompletedActivity". This UI will allow us to display the MSR data to the user. Next will will add the code to "MSRCompletedActivity" for capturing the startActivity Intent and displaying the result data to the user. 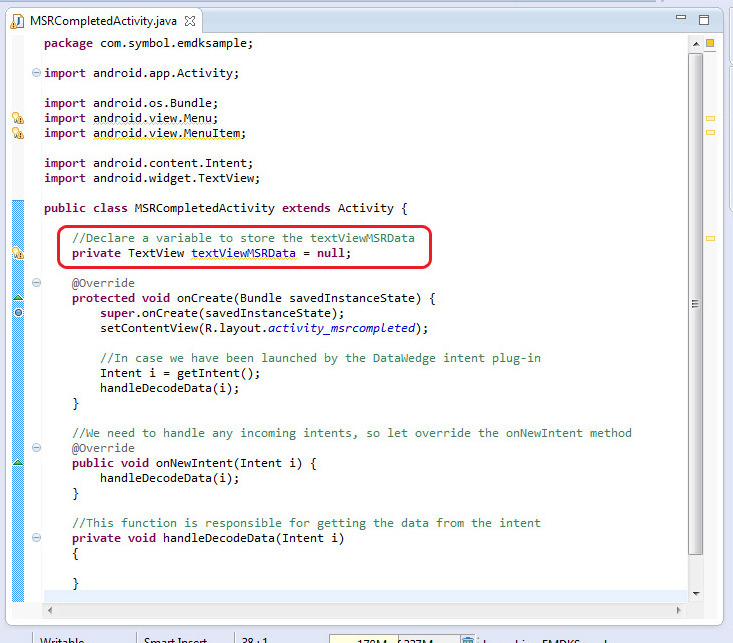 Select "MSRCompletedActivity.java" from "Package Explorer". 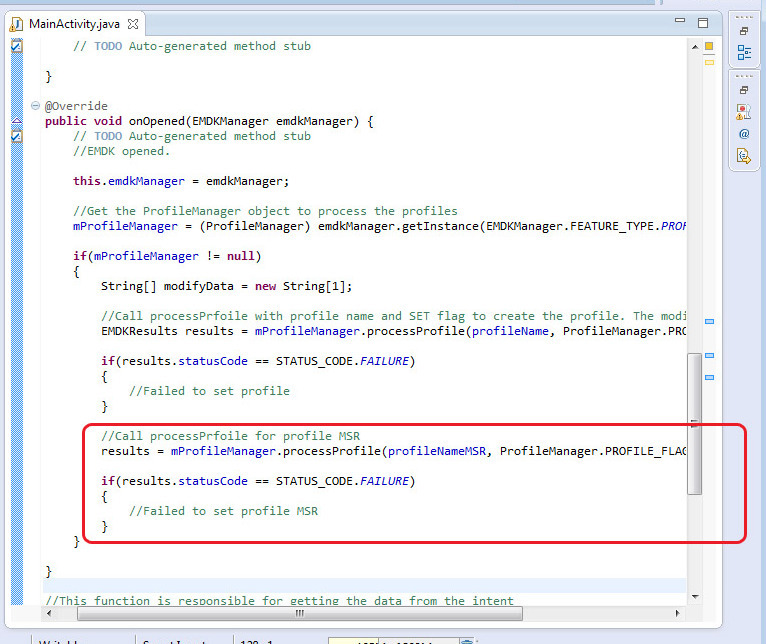 Add the following function for processing intents. 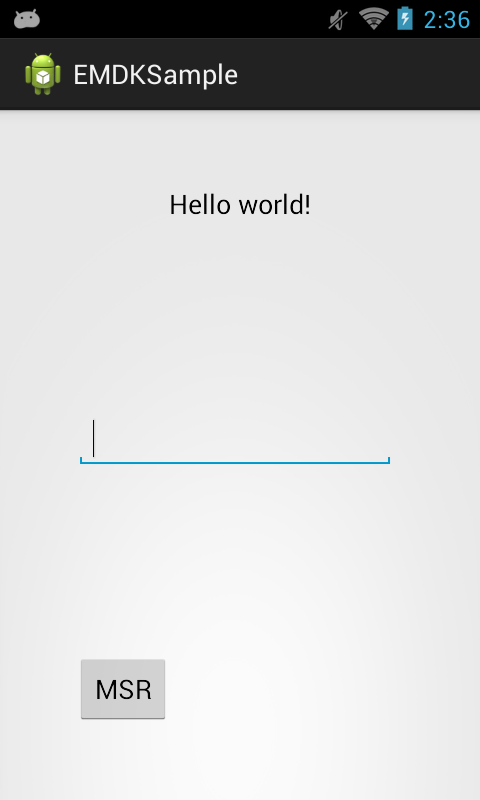 Overide "onNewIntent" to handle incoming intents. Add a global variable for the TextView. 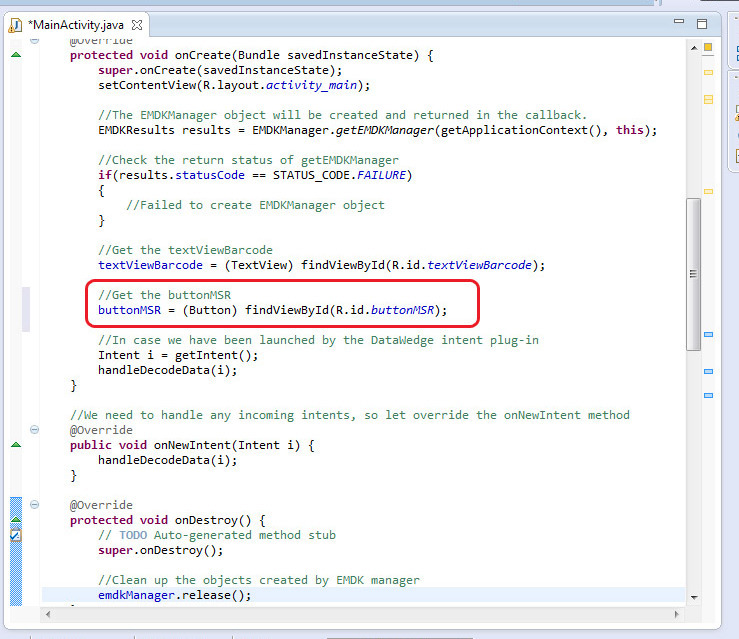 Add the following code to your onCreate function to get a handle on the TextView. 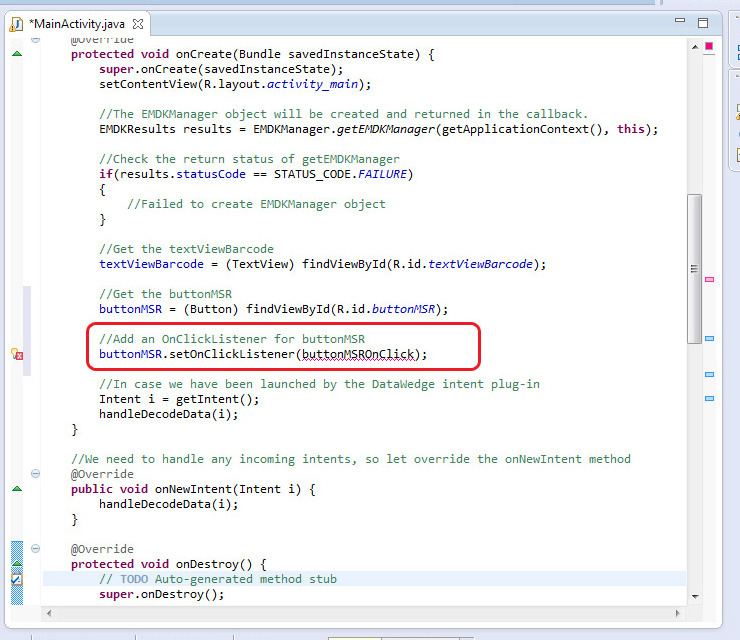 Add the following code to your "handleDecodeData" function to confirm the intent was meant for us. 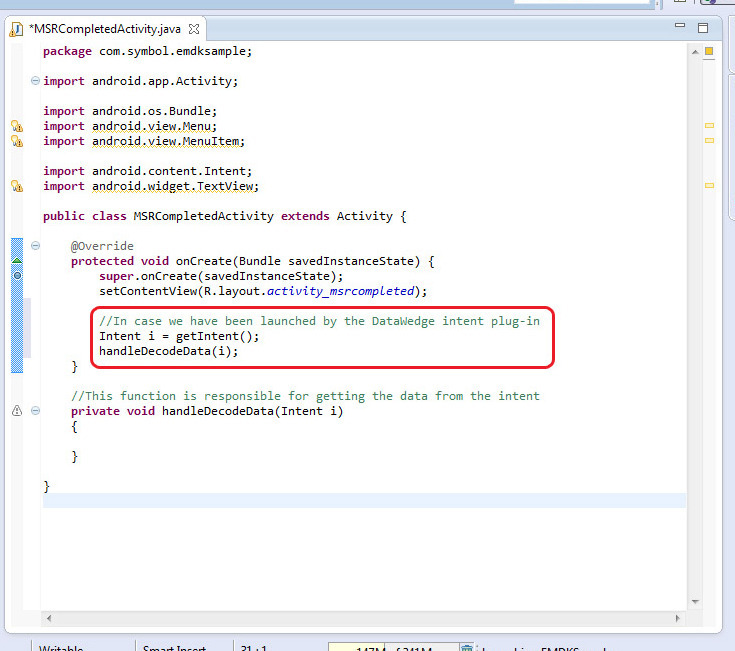 Add the following code to your "handleDecodeData" function to check if the intent contains MSR data. 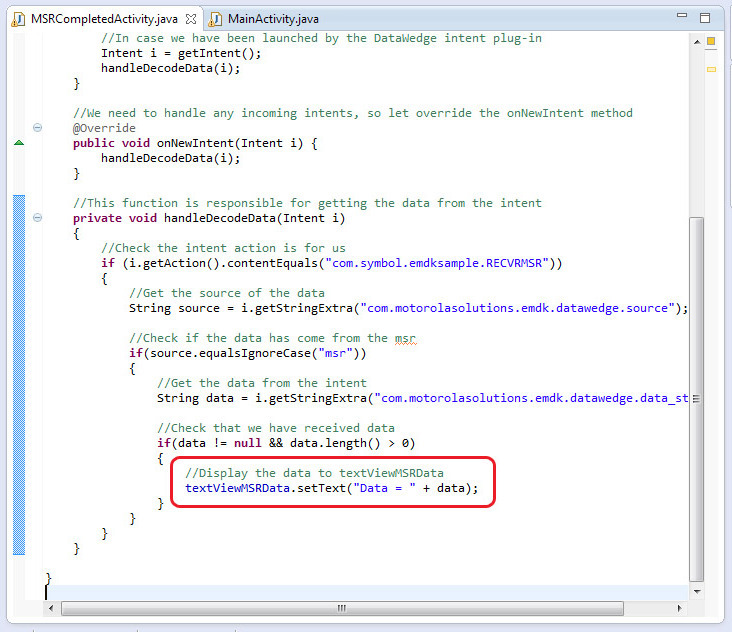 Add the following code to your "handleDecodeData" function to retrieve MSR data. 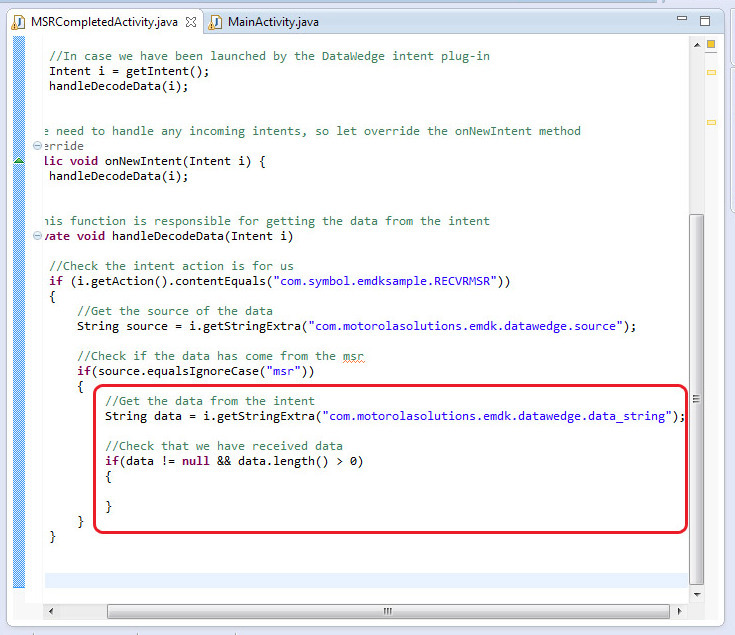 Add the following code to your "handleDecodeData" function to populate the TextView with the revived MSR data. Lastly we will run and test our application. Press the trigger button and scan a Barcode. Like before the scanned data will be populated in the Edit Text field Through the previous Keystroke Intent and will appear on the Text View using the previous Datawedge Intent. Swipe a cad through the MSR. Press return to go back to the MSR where you can swipe another card, or hit return again to go back to the main screen. 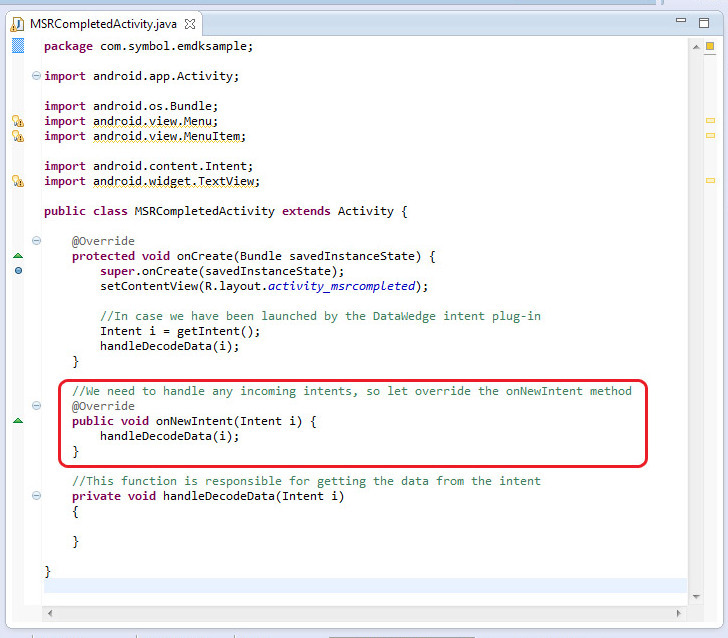 The next tutorial will show you how to use the Intent Output as a Broadcast instead of starting an activity.